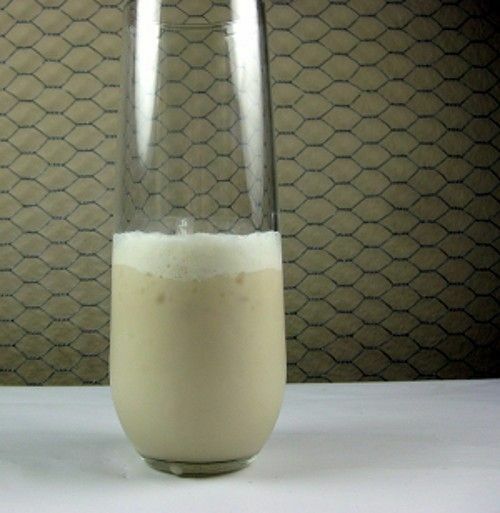 The Smooth Operator is a banana based cocktail – and I don’t mean banana flavor, I mean you blend half a banana in with this drink to give it a rich creamy texture and flavor. And rich is is – the banana is accompanied by heavy cream and healthy doses of Frangeligo, Kahlua and Baileys. It’s a very full, rounded sort of flavor that’s very nice after dinner or anytime you want a drink to sip along on without food, since the food’s built in. Put all the ingredients in the blender along with a scoop of crushed ice. Blend on medium until smooth.